Twenty-five years ago, rabbinical scholar Alan Segal produced what is still the major work on the idea of two powers in heaven in Jewish thought. 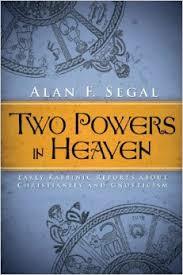 Segal argued that the two powers idea was not deemed heretical in Jewish theology until the second century C.E. He carefully traced the roots of the teaching back into the Second Temple era (ca. 200 B.C.E.). Segal was able to establish that the idea’s antecedents were in the Hebrew Bible, specifically passages like Dan 7:9ff., Exo 23:20-23, and Exo 15:3. However, he was unable to discern any coherent religious framework from which these passages and others were conceptually derived. Persian dualism was unacceptable as an explanation since neither of the two powers in heaven were evil. Segal speculated that the divine warrior imagery of the broader ancient near east likely had some relationship. In my dissertation (UW-Madison, 2004) I argued that Segal’s instincts were correct. My own work bridges the gap between his book and the Hebrew Bible understood in its Canaanite religious context. I suggest that the “original model” for the two powers idea was the role of the vice-regent of the divine council. The paradigm of a high sovereign God (El) who rules heaven and earth through the agency of a second, appointed god (Baal) became part of Israelite religion, albeit with some modification. For the orthodox Israelite, Yahweh was both sovereign and vice regent—occupying both “slots” as it were at the head of the divine council. The binitarian portrayal of Yahweh in the Hebrew Bible was motivated by this belief. The ancient Israelite knew two Yahwehs—one invisible, a spirit, the other visible, often in human form. The two Yahwehs at times appear together in the text, at times being distinguished, at other times not.